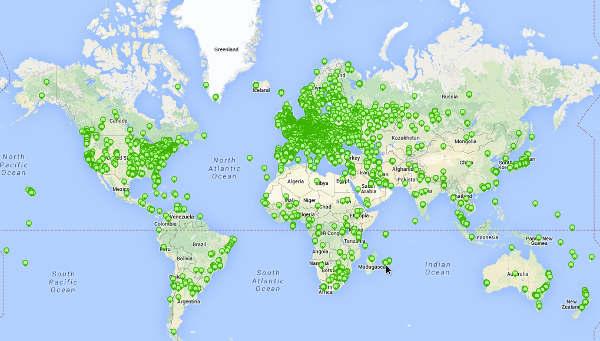 There are thousands of active probes in the RIPE Atlas network, and it is continually growing. The RIPE NCC collects data from this network and provides Internet maps, data tools and visualisations based on the aggregated results. RIPE Atlas users who host a probe can also use the entire RIPE Atlas network to conduct customised measurements that provide valuable data about their own network. What Can I Do With RIPE Atlas? You can access a complete collection of use cases, published research and analyses based on RIPE Atlas on RIPE Labs. RIPE Atlas probes are small, USB-powered hardware devices that hosts attach to an Ethernet port on their router via a network (UTP) cable. They conduct different measurements and relay this data to the RIPE NCC, where it is aggregated with data from the rest of the RIPE Atlas network. The probes use a very small amount of bandwidth and cannot determine any information about the content passing to or from their host computers. Probes conduct the following types of measurements: ping, traceroute, SSL/TLS, DNS, NTP and HTTP (to selective targets). World map showing probes' locations. RIPE Atlas anchors are both enhanced RIPE Atlas probes with much more measurement capacity, as well as powerful regional measurement targets within the greater RIPE Atlas network. They provide valuable information about the local and regional connectivity and reachability of the Internet. The RIPE Atlas community is made up of users, hosts, sponsors and ambassadors. Anyone who accesses RIPE Atlas maps and statistics, which are open and available to the public, is considered a RIPE Atlas user. A host is anyone who connects a probe or anchor to their own network. Hosts can conduct their own customised measurements in order to gain valuable information about their network using other RIPE Atlas probes. A sponsor is an individual or organisation that financially supports RIPE Atlas. An ambassador is someone who helps us distribute RIPE Atlas probes. RIPE NCC members can also take advantage of special RIPE Atlas features, even if they do not host a probe. The Internet community can access RIPE Atlas data in a number of formats, including Internet maps, visualisations and tools, and use it for their own purposes. Some examples of analyses performed using RIPE Atlas data include a case study of IPv6 /48 filtering, the impact of Superstorm Sandy on Internet traffic routing, and comparing response times of DNS servers. Learn more about the different ways engineers, network operators, researchers and others have used RIPE Atlas data. RIPE Atlas hosts aren’t only helping to create the world’s largest Internet measurement network – they also earn credits they can use to conduct their own customised measurements using the entire RIPE Atlas network, which can provide valuable information about the performance of their own network. Anchor hosts earn ten times more credits and are recognised on the RIPE Atlas website. RIPE Atlas sponsors enjoy additional benefits, such as extra credits that can be used to perform even more customised measurements and special acknowledgement on the RIPE NCC's website. RIPE NCC members, even if they do not host a RIPE Atlas probe, can take advantage of special features available only to them, including testing their IPv6 reachability, claiming one million credits to perform their own customised measurements, and performing quick look measurements. RIPE NCC members also receive privileged and early access to the pool of all collected measurements. Find out more about how to get involved with RIPE Atlas. Our ambition is to create an opportunity for unexpected and creative uses of Internet traffic measurement data based on the world's largest active measurement network. We believe this data is valuable for network operators, researchers, the technical community, and anyone interested in the healthy functioning of the Internet who wants to learn more about the underlying networking structures and data flows that keep the Internet running globally. With those goals in mind, we will continue to work together with RIPE Atlas users, RIPE NCC members, network operators and the wider Internet community to expand the reach of RIPE Atlas and allow anyone interested to easily access RIPE Atlas data. With RIPE Atlas, the RIPE NCC hopes to create the world's largest Internet measurement network. In order to achieve our aim, we rely on interested members of the Internet community - both in the RIPE NCC's service region and around the world - to host RIPE Atlas probes and anchors that relay the results of automated measurements to RIPE Atlas's central infrastructure at the RIPE NCC. With your help, we hope to continue to expand the network with the ultimate goal of many thousands of probes distributed globally, providing the most detailed picture of the Internet's infrastructure ever created. Learn more about the different ways to get involved.